Gulfstream Park will continue its Champions Meet Day #82 Tursday, with ten races and first post of 1:15 p.m. The Rainbow 6 jackpot was not hit yesterday, and the carryover will be $1,970,071 today. Adding in approx. $250,000 to the pool today, the jackpot will be over $2 million by our estimates. We think 2 or 3 highs odds horses winning in the 6 race sequence will be needed to garner just a single winning wager. Gulfstream may announce a mandatory payout on March 30th, Florida Derby Day. The Rainbow 6, a 20-cent per combination only bet, will be on races five to ten with the sequence scheduled to start at 3:15 p.m. 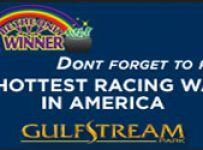 The carryover has grown because Gulfstream has gone 24 straight race days without the jackpot payoff requirement of just one ticket with the winners of all six races. The jackpot consists of the entire carryover plus 80 percent of the day’s new bets on the Rainbow 6 (20 percent takeout). 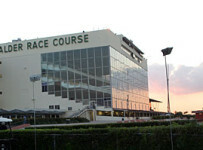 In Wednesday’s action, all races were taken off the turf, and low odds winners were the norm. The Rainbow 6 paid $667.42 to about 250 winners. Four of six legs were won by the favorites. The Late Pick-4 paid $175.95, while the Late Pick-5 paid $213.95.